This is the book that opened the door to my storytelling journey for me. At the time, I was reading folktale picture books to my 4 yr old and enjoying her experience of them, as well as remembering my own childhood delight in them. The Grimm’s collection of tales had been a powerful, metaphorical presence in my youth. It was also during this time in my life that I was working with Jungian archetypes, exploring dream images, studying history, and steeping myself in the works of thought-leaders like Barbara Walker, Riane Eisler and Joseph Campbell. The story of a young girl thrown into an impossible situation because of a lie told by her father was deeply resonant with my life on a metaphorical level. The appearance of a magical being who spins ordinary straw into treasured gold reflected the possibility of transforming the mundane and sometimes unappealing stuff of my life into a rich treasure. In the final scene of the story, she must guess his name in order to keep her child. It was at that moment I realized that all stories could be viewed through the lens of archetypal thinking, in particular the rich collection of cultural folktales. It became clear to me that Rumpelstiltskin held some pretty powerful Juju. 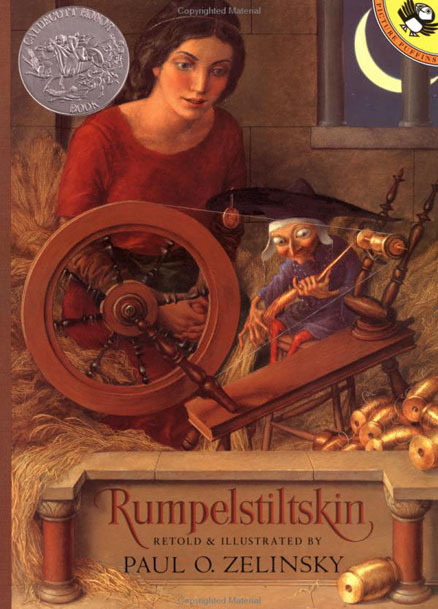 As I spent time with this story over the next two decades, I learned that once we become clear about a thing, and give it a name, we are empowered to change it and just like Rumpelstiltskin, once named, it will vanish. Which is to say, it dissolves into our inner landscape, and the energy that animated it is free to move into another, life-affirming form. In Story Wisdom, this is what I think of as the Rumplestiltskin Effect. Rather than seeing the hurdles and problems as monsters to be dispatched we become free to listen for the gifts they bring. In this story, Rumpelstiltskin was the catalyst that enabled her to become queen and, with the king, bring a child into being. In discovering his name, the queen ensured that her creative expression would remain with her. This tales tells us that we all have the power within us to transform our lives through our missteps, our troubles, and our willingness to seek the truth. I am an affiliate for Amazon.com. If you choose to purchase a copy of Rumpelstiltskin through my site, I will receive a commission.